AeroHydro’s founder and chairman Dr. John Letcher is the author of a new reference book titled The Geometry of Ships, published in 2009 by the Society of Naval Architects and Marine Engineers (SNAME). The Geometry of Ships is Volume 1 of what will eventually be a 9-volume series, collectively titled Principles of Naval Architecture. Other volumes in the series cover intact and damaged stability, ship structures and strength, propulsion and resistance, motions in waves, and directional control. Past editions of the series have been widely used as reference material and textbooks for the field of ship design and engineering. The new edition has a much stronger emphasis throughout on computer-aided design methods. 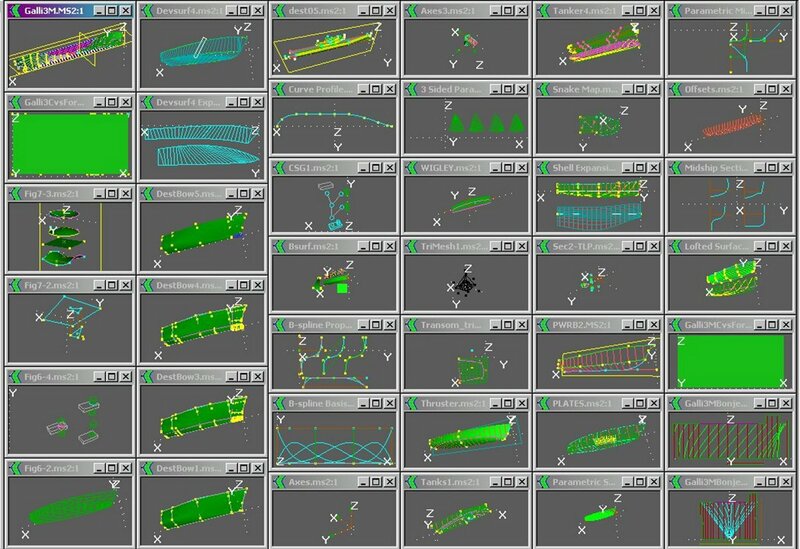 Principal topics of The Geometry of Ships include: points and coordinate systems; geometry of curves, surfaces and solids; subdivision surfaces; hull surface definition; displacement and weight; form coefficients; and upright hydrostatics. Download all the MultiSurf model files associated with Figures included in Dr. Letcher's new book - "Geometry of Ships"
View a partial list of model descriptions.